Saint Anton # 53 est la location idéale à Mammoth Lakes pour une petite famille ou un groupe d'amis voyageant avec un compagnon à quatre pattes, ce qui convient aux animaux de compagnie! Saint Anton est situé dans une zone privilégiée de Mammoth pour accéder à toutes les activités, y compris le snowboard, le ski, la randonnée, le vélo, le golf et aller au centre-ville. Les vacanciers désireux d'aller à la montagne apprécieront la courte distance de marche de Canyon Lodge. La télécabine du village est également à proximité. Un plan d'étage ouvert vous invite à l'intérieur. Il y a une cuisine, salle à manger, salon et balcon constituant un espace de vie commun. Une cuisine bien équipée se trouve sur votre droite lorsque vous entrez. Cette cuisine a beaucoup de comptoir et tous les appareils dont un chef aurait besoin pour préparer un délicieux repas. Passé la cuisine et la salle à manger, vous trouverez un salon confortable avec une cheminée et une télévision à écran plat. Allumez un feu après avoir passé la journée sur les pistes pour vous réchauffer et créer une atmosphère chaleureuse. Détendez-vous sur le canapé avec un bon livre ou allumez le téléviseur pour vous détendre avec un film. Un lecteur DVD et WIFI sont fournis pour votre divertissement. Le canapé fonctionne également comme un canapé-lit pour 2 personnes. Si vous voulez une bouffée d'air frais, sortez sur le balcon privé et admirez la vue environnante sur les grands pins. Au bout du couloir se trouve la chambre principale. Cette chambre est meublée avec un lit king-size, une petite télévision à écran plat et une salle de bains principale attenante. La salle de bain principale a un combo douche / baignoire et une coiffeuse séparée. St Anton propose plusieurs autres commodités à utiliser pendant votre séjour. Il y a une place de parking dans le garage (dégagement de 6'8 "). Un pavillon commun comprend un coin salon, une table de billard, un distributeur automatique et une kitchenette. Il y a aussi une laverie pour les longs séjours. Une piscine extérieure & amp; Les stations de barbecue ne sont ouvertes que pendant l'été. Un bain à remous et un sauna sont disponibles toute l'année. 3) Gardez votre chien en laisse (c'est la loi). Si vous ne suivez pas ces règles, il y aura 100 $. 00 bien. The tub/shower has been painted, it’s badly done and peeling everywhere. The basics of the condo are fine but it really needs some updating to just make it even “fair”. TV remote in bedroom doesn’t work, peeling tub shower is really gross and mattress is pretty uncomfortable. Good location though. The condo was clean, comfortable and the location can't be beat. Although we didn't need it this time, covered parking is a plus! The mattress could be better, but is good enough for a few days stay. We will definitely be back. Overall the stay was great! I do wish there was air conditioning or a ceiling fan. Overall great place. Next door to the ski resort. Great hikes! The room did smell of cats though. 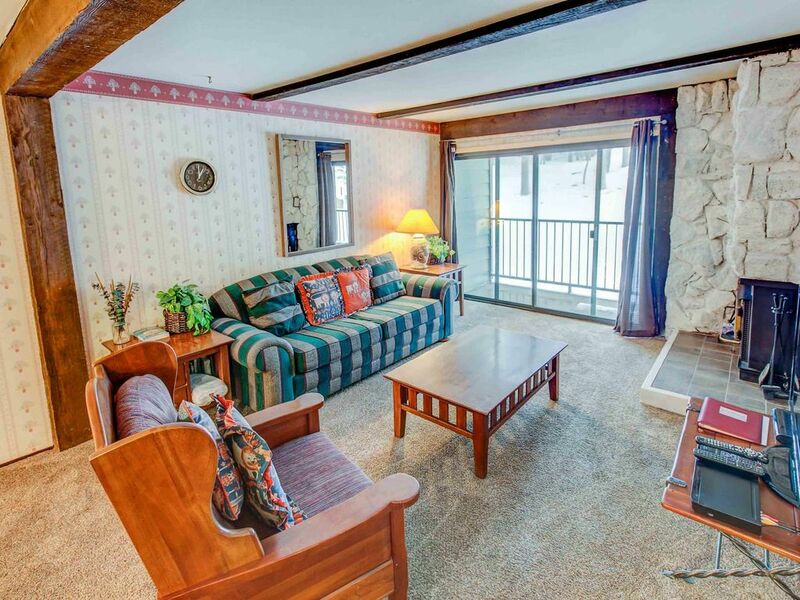 The property is in serious need of renovation- both the condo and the overall complex. First of all, the shower was DISGUSTING! Someone had painted it - yes paint. It was in the process of peeling off and every shower resulted in more broken peeling pieces. Since it peeled just from running water, it can't have been cleaned well before our arrival. The sheets on the bed were clean but the cover was old and ratty and just felt dirty, I was afraid to touch it. There was a note in the closet - "please fold blankets after use and place in closet." Eewww! The living room and kitchen were clean enough, but there were no oven mitts or pot holders and none of the TV remote controls worked. I probably would have forgiven all, but the dirty shower, if the property had actually been pet friendly. The owners of the unit might be but the St. Anton management most certainly is not. There was a mold problem in the hallway; I know this because my husband is allergic to mold and had to run through holding his breath. The property was being repaired. On our first day, we went out for lunch and returned to a nasty note. "Stop your dogs from barking, take them with you, or you will be evicted." Our dogs were so frightened by the hammering, sawing, vacuuming noises that it took them a few minutes to realize it was us at the door. They were shaking from head to toe. Now I understand that their barking was unacceptable, however I would have preferred a polite knock on the door and a conversation that began with an apology for the racket and the mold. The location of the property was fantastic - a few steps to Cayon lodge. However, you couldn't pay me to stay there again! We are extremely sorry for all the inconvenience you went through with this unit. We hope your future stay with us it better equipped for you and your loved ones including your pets. Thank you for letting us know about the issues. We will dispatch our team to fix all the issues for your future stay. I was a little worried due to some of the reviews about this condo. When I walked in it smelled really clean and looked very clean. It has cute furniture. The wooden chairs had a pine tree design and the decor was very cabin like. The heaters worked and the kitchen was great. We timed our showers and ran the dishwasher after everyone showered. The location was great. I would stay here again. We are happy to be informed you had a wonderful stay with us. We appreciate your feedback, thank you. We hope to host you again. While the place was clean and had a nice view, it was sorely dated and poorly equipped. The couch and the bed were terribly uncomfortable. The lighting was dim and insufficient and there were no clothes hangers in the closet or dish towels in the kitchen. The fact that we had to drive to town to the property manager for clean towels and toilet paper was a bit ridiculous after what we spent for the place. The common areas, jacuzzi and parking were nicely kept, but the front desk clerk was quite rude and lectured me about keeping our puppies not being on a leash after she came charging into the hallway during some perceived emergency. She scared our pets and caused them to scatter and said that her emergency was more important than our animals. We've never been treated like that and will likely not stay at St Anton again because of it. We are extremely sorry about all the inconvenience you encountered. We will contact the correct people to fix these issues. We hope to make any of your future stays more pleasing. Thank you for your feedback, we hope to host you again.